I feel bad for the guy who wanted to use that poor unplugged toaster. Yeah, but I undestand the office dynamics going on here. The guy who uses the toaster is a mild-mannered person. He goes into the breakroom every morning with his bread and butter. When he sees the toaster is unplugged – again – he just sighs and eats his bread untoasted. He’ll seethe quietly over his chamomile tea, but that will be the end of it. But the coffee drinkers? They’re a little unhinged when they walk in the door. The only thing that will restore their sense of calm is a stimulant. Just enough – not too much! If they walk into the breakroom with an empty mug and then they see the coffee maker is unplugged, they can barely contain their rage. They’ll stand in the breakroom while a fresh pot is made, ranting at anyone who walks in the door. “Did you unplug the coffee maker?! I told you not to unplug the coffee maker! You can’t let the magic elixir run dry! 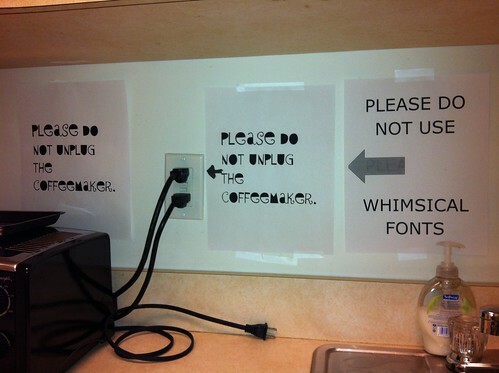 I NEED MY COFFEE!” They’ll be so disgusted that they will put up a sign in the craziest font they can find. They’ll stake out the room with watchful eyes. And if they ever find out who is behind the coffee-maker-unplugging crime, there will be blood. Lesson of the day: Never piss off the coffee drinkers. Until the years, maybe even decades, of quietly seething over untoasted bread and chamomile tea suddenly overwhelm that little spot inside Mild Mannered’s brain. The brain cells, that have been holding back anger and rage like the Hoover Dam, are suddenly obliterated. Then, God help you if your parking lot can be seen from a clock tower. He’ll put strichnyne in the guacamole. I would rage on anyone I see posting a note with that font. At least the whimsical font signs use proper punctuation. There’s no such thing as “proper punctuation” in such a brief note. It’s not a dissertation. It doesn’t require a period at the end any more than it requires a title at the top or an introductory thesis. It requires the minimum amount of words to convey the message, and if they’re all spelled correctly, that’s gravy. You’re right, spoko. “Please do, not: unplug the…Coffeemaker!” works just as well. I think you meant ‘number of words’. Otherwise your reply simply isn’t gravy. Looks like the NYC office could use a power strip. “Please do, not: unplug the…Coffeemaker!” works just as well. Read in the style of W. Shatner. Really – “if they’re all spelled correctly, that’s gravy?” Why is correct spelling such a bonus – isn’t it just part of what is considered basic communication skills? See, I think proper spelling is a detriment to a passive-aggressive note. When I read a PAN, I prefer it to be pure unadulterated crazy. I want Random Capitalization, odd!! punctuation!! (especially multiple exclamation points!! ), and un-usual and odd speeelings. P.S. If you don’t agree with me, I WILL CUT YOU!!!! I completely agree with you, but will you cut me anyway? It’s sort of a fetish of mine. I like to pretend that I’m a warm loaf of bread just out of the oven, and the other person is the naughty knife-wielding baker ready to butter me up. Only if you pay me. 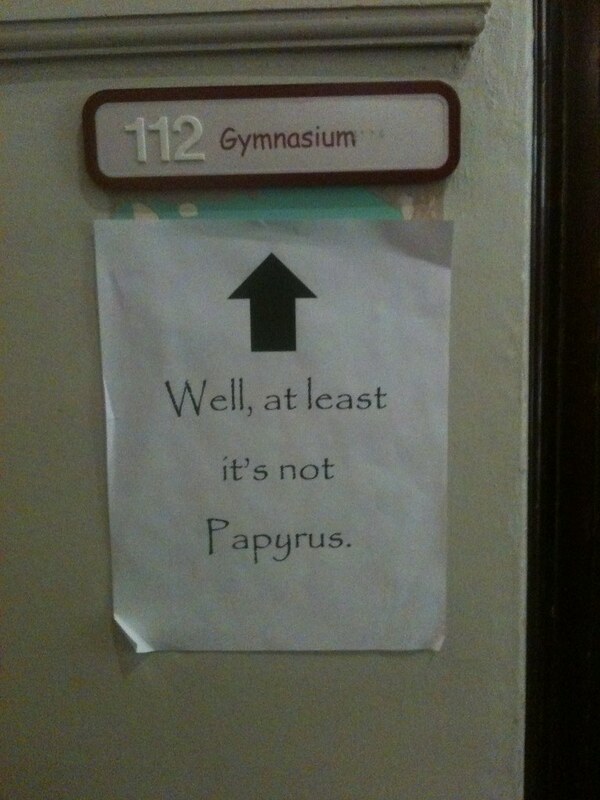 I don’t understand the Papyrus hate. I think it’s a pretty font, if used sparingly. At last we have been spared the STOP clip-art dot with whistle and gloved hand. I live in the Willamette Valley! I would love to know where the second one is so I might add my own terrible-font-bashing note. My sister has a tattoo in papyrus font. When I saw it I cringed. So if you can’t use Comic Sans, Papyrus, or Whimsical, what can you use? I’m a Century Gothic fan. I like Copperplate (small caps font). They used Middle English in the Middle Ages. Georgia is a very lovely font. I was listening to a talk show on NPR where they were discussing fonts (fascinating, by the way) and someone referred to Comic Sans as the Nickelback of fonts. And I finally found out what the backlash about Comic Sans was all about. The gymnasium font is what is generally used in schools, as it is one of the only ones that uses an “a” which matches the way children do as well. Every school I’ve worked in used it . . . I learned the cursive-type “a” when my 1st grade teacher kept on using it instead of the “proper”, printing a, as used on this forum. Is it awful to admit that even as an adult, I can’t draw an amperstand or print the little “a” as it appears in times new roman? I have bad hand I coordination. I even have problems with the cursive capital G.
I agree, Comic Sans IS bad. They should have used Klingon or say, Tengwar (LOTR font).